nyandw wrote: I didn't intend to discuss railings, just provide a reference point of White Pot, where it is and what it looks like for the one or two folks here that have never been there to help us with the OP question.My apologies that my "nice" website failed to answer the OP question. I meant no offense to your website or the info you posted. But your writing to me sounded as if the website had info related to the railings. Maybe to me I thought about something new was taking place in athe area which required new railings to be installed. Your response stated (paraphrasing): Here is information about White Pot which to me sounded as if the info on the railings would be included. NYANDW, I meant no offense to your website or the info you posted. But your writing to me sounded as if the website had info related to the railings. Maybe to me I thought about something new was taking place in athe area which required new railings to be installed. Your response stated (paraphrasing): Here is information about White Pot which to me sounded as if the info on the railings would be included. My apologies. The "tunnel" is the underjump. Service came from the West then went South at White Pot. The approach to the underjump was filled in over the years. Mr rt wrote: The "tunnel" is the underjump. Anyone with current photos of White Pot locations to compare to the 40+ years ago views? Before/after materiala. Steve I might. I know I have some from around 5 years ago, and a bunch from maybe 1995 so. They all pretty much look the same: the area is heavily overgrown. I'm not sure you could even get a direct before and after photo since that area is filled with trees and brush now. Maybe during winter months? The 'forest' there was a local drinking spot for kids back in the 90s. Last I knew, the north side was mostly filled in - though there was still a small hole you could slide down into to get inside the underjump. On the south side of the tracks it was still pretty wide open. I've always wondered about the odd terminology "under jump" used to describe the route from the Rockaway Line northbound underneath the main line at Whitepot and connecting to the westbound main line. The PRR terminology associated with flying junctions were "fly-over" and "duck-under"; so I wonder how this particular track/structure at Whitepot became known as an under-jump instead of a duck-under. DogBert wrote: Steve I might. I know I have some from around 5 years ago, and a bunch from maybe 1995 so. They all pretty much look the same: the area is heavily overgrown. The photos 1995/2007 would be of interest for those of us that have never been there. Also, bear in mind (everyone) that what is commonplace/normal/familiar is not years later. Sidebar: Islip huge Coal and Feed Bunker c.1900-1969 razed. In 45+ years have never seen/found a photo; other than the bad 110 shot through the fence I took. Sure folks, post it up.! You are in luck. The majority of my photos from that time are still on slides that have never been digitized. For some reason though I happened to scan these 4 a few months back. These were from summer of 2001, probably June or July. DogBert wrote: You are in luck. The majority of my photos from that time are still on slides that have never been digitized. For some reason though I happened to scan these 4 a few months back. 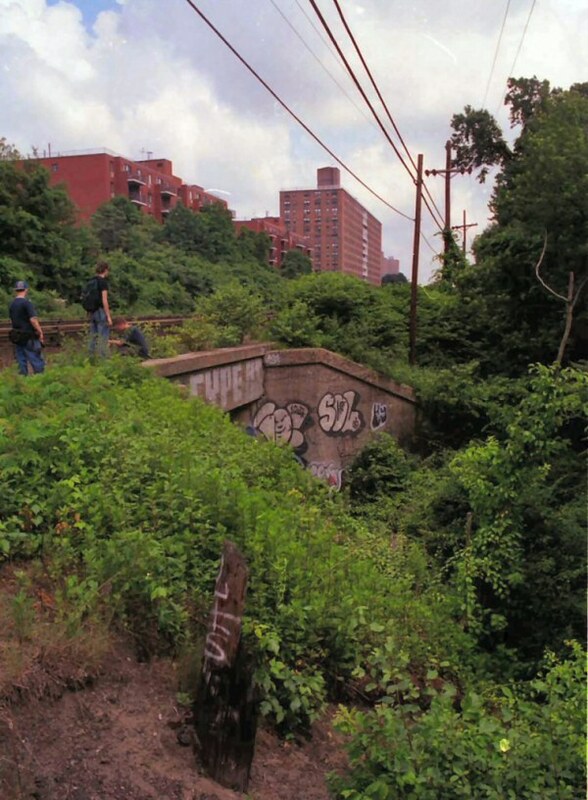 jhdeasy wrote: I've always wondered about the odd terminology "under jump" used to describe the route from the Rockaway Line northbound underneath the main line at Whitepot and connecting to the westbound main line. I think "under-jump" is a particularly LIRR term. My old 1958 Employees Timetable refers to the flyover west of Woodside as "Harold Underjump." I guess it's an underjump or an overjump, depending on how you look at it. I remember that the Rockaway Beach branch tracks were still in place here, including the westbound track through the tunnel, ending just before the site of the old Rego Park station, up until just a few years ago. I was very sad when the tracks were removed, because as long as they were there, I could maintain the forlorn, unrealistic hope that someday, Rockaway Beach Branch service would be restored in some form. Even though the LIRR was under PRR control, they always did some things in a "non-standard" way. Same as crews calling cabooses "hacks" while the PRR called them "Cabin Cars." (Although officially LIRR did (and still does) call them Cabin Cars. Unofficially, they're hacks. Well, I was looking to see if there were any threads on here (or NYCTransitForum, etc) about that supposed 63rd Rego Pk flyover tunnel from that subway line to Whitepot. Well, any threads in the last few years with more information about it at least. I seem to remember someone once saying it was the largest (then) unexplored MTA tunnel at the time. I'm sure as hell not going to have a look myself, but I'd love to know if anyone did. After all the surreptitious spelunking over the last few years, I thought it odd no one posted pictures; even anonymously somewhere. Anyhow, nice to be back again. "I decided to find out where the track went, and never looked back...got hit by a train." I was aboard the last train through Whitepot ( we natives used to call it Whitepot Junction) on June 8, 1962. "Whitepot" is the pre-real estate name of Forest Hills. Until about 1925 or so there was a Matwok station at the underjump with platforms on the Main Line and Rockaway Branch. Even though the LIRR was under PRR control, they always did some things in a "non-standard" way. In addition to numbering main tracks in NYC- and NH-style instead of south to north regardless of direction of traffic, and numbering the tracks in Jamaica Station from north to south--yet the sky did not fall.